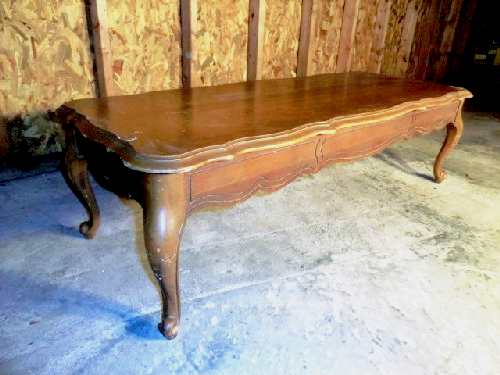 In a recent interview, our own Marty Roberts made the comment that “We (LOT 2540) model what it is like to go from broken to restored in a very physical way.” Customers of the LOT 2540 salvage store buy old, used items such as this dirty coffee table and repurpose them for a new use and a new life. 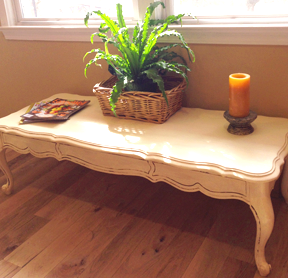 When this table was built, it was a beautiful piece of work – a Queen Anne style, solid wood coffee table with a lustrous cherry finish. But as it sometimes happens in life, the table slowly lost its beauty. A watermark here, a scratch there, a few loose screws and before long, the table ended up in the corner of a dark basement – it’s usefulness at an end. Then one day, the table was sold at an estate sale. The new owner saw the possibilities underneath the dirty exterior. So she took it home and with hard work, a paint brush and some basic repairs, the table was restored. Once again, it is fulfilling its purpose – as a lovely and useful piece of furniture for someone’s home. At LOT 2540, we see people who are broken, hurting and in need of help, of restoration. Life’s hard times, such as job losses, divorce, bad relationships and wrong choices, have caused them to lose their way. So we do what we can to meet their immediate needs for food, clothing, shelter and getting out of harm’s way. Our hope is to build long-term relationships with our clients, to help them move from a time of crisis in their lives to complete self-reliance. Through education, job training, finding the right resources and nourishment for their souls, we are able to help them reclaim their futures. It’s a beautiful picture – broken lives salvaged and restored for the purpose that they were created for. We are so blessed to be a part of that process for we too were once broken and now through Him, we are restored. Won’t you come be a part of Repurposing Lives, Reclaiming Futures and Restoring Hope with God’s Help?